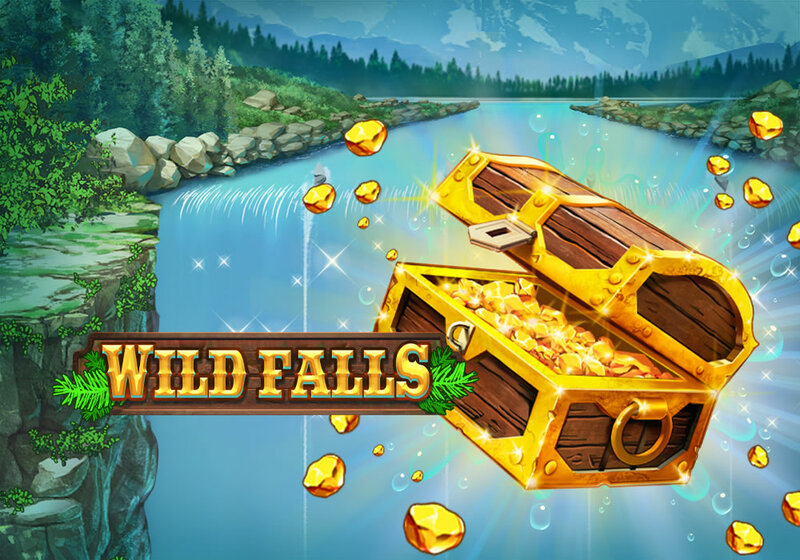 Play’n Go also released a new online slot game this month called Wild Falls. This new slot game with 20 lines on 5 reels uses a river, gold rush theme. The game show the reels over a wild river that has treasure chests floating on it. The graphics are great, the soundtrack fits and makes you feel like you are back in the gold rush time. As with all Play’n Go slot games, you can easily adjust the bet, use fast play and set an autoplay feature. These treasure chests are wild symbols. These treasure chests can go down the river and land on the reels at random. They can only appear on reels 2, 3 and 4. When they do, they become a sticky wild. After it becomes a sticky wild you will get a free re-spin and maybe get even more treasure chests to land on the reels. When you have three or more treasure chests on reels 2, 3 and 4 at the same time you will start the free spins feature. You will get an unlimited number of free spins as long as treasure chests appear on the reels. After each spin the treasure chest will move down one spot on the reel after it will fall off when it has reached the bottom row. At random the treasure chests can also become gold. This is the Gold Rush feature. This works the same as above, treasure chests can stick on the reels and will also give free re-spins. Getting 3 or more on reels 2, 3 and 4 a,lso awarding unlimited free spins. But now the treasure chests also come with multipliers of x2, x3 or even x5. So getting three x5 wild symbols in a winning combination will multiply that win times 125! Which is huge! During this Super River of Gold feature you can really win big. I love this new Wild Falls slot game. The game looks great and the features are amazing. This game, like a lot of the Play’n Go slot games, can really pay out big wins. I would definitely suggest giving this new game a try. You can play Wild Falls at Gate777 and Casumo, among a lot of other NetEnt casinos offering Play’n Go slot games, which most of them do. Also be sure to check out the Video for Wild Falls slot game below.